If you work from home, or you’re planning on doing in the future, making sure you have the right workspace is crucial to being able to work as effectively as possible. Redesigning your existing office or transforming a room into a dedicated workspace can give you not only room to work but also be a tailored workspace that is perfectly suited to helping you get the most from any project you work on. So, what should you keep in mind when it comes to your home office refurbishment? Your home office doesn’t need to reflect a specific brand or corporate identity. It can be a reflection of your personality and be somewhere that you feel inspired and motivated to work. The choice of colour scheme you make will bleed into every aspect of your refurbishment. This doesn’t just influence the colour of the walls. The decision you make will tie into your choices of furniture, the design of your soft furnishings, and even the styling of accessories, stationary and other office equipment. You should choose items that fit the room, and decorate the space to suit what you do and your personality. Creating something that is uniquely you and inspires you to work should be the overall goal of your refurbishment. One major element of your office redesign is going to be how you stay organised. Having the proper storage for tools, materials and your files is crucial. Look at what works best for you. Do you need something large like a filing cabinet? Or do you work on a much smaller scale meaning you only need a box that could be stored in a cupboard? Can the equipment and office supplies you use stay on a desk or do they need to be moved out of the way after work? Does this mean you need a store cupboard or simply to find a way of better organising a desk? Consider what you actually need to do your job, making sure you only have what you need can avoid unnecessary clutter and help you keep your working area much cleaner and more organised. Your refurbishment might not be purely cosmetic. You might be updating your workspace by improving the computer you use or the other equipment that helps you work from home. For example, you might work from home creating clothing you sell online, meaning your home office is more of a design studio, admin hub and workshop. As demand increases you might need to invest in a more robust sewing machine or a different dress form. 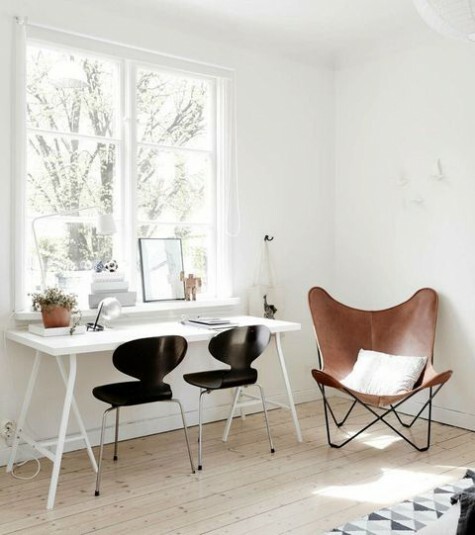 Organising your workspace or home office in such a way that you can incorporate new tools or ways of working can help improve productivity and the work you deliver. This might also influence the sort of refurbishment you do, you might need to look at reorganising your office to create the space you need to work more effectively and accommodate new equipment. Redesigning, reorganising and redecorating your office can help refresh your desire to work and act as a source of ongoing inspiration. Even the simplest changes can create a new setting that’s more in tune with the way you work and designed to inspire. This can help improve not only your motivation but also the quality of the work you do.